In fourth grade, students study the history and people of our state. Because North Carolina has such a rich and diverse cultural history, teachers decided to do a Folklife project that highlighted the diverse people who inhabit our state and their traditions. Before beginning the project, teachers used their reading and writing workshops to build important background knowledge. In reading workshop, students learned strategies for reading nonfiction as they read social studies texts about the history and people of North Carolina. After students acquired considerable background knowledge regarding North Carolina’s history, people, land and resources, they were ready to begin their North Carolina Folklife Project. 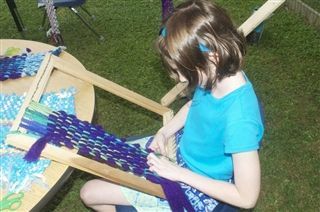 The project began by a teacher telling the story of her experience at the Eno River Festival on the fourth of July. Teachers e-mailed parents regarding the project and asked them to talk to their children about experiences with traditional North Carolina art, crafts, music, cooking and dance. Students were asked to bring in a story or a photograph about their experiences. We discussed them in groups, and students used photographs, pictures and text to illustrate their experiences. Teachers posted them on the bulletin board. The class began their research by doing field work at the North Carolina Museum of History in Raleigh. Students took clipboards and digital cameras to record interesting information about the different cultural groups that make up the people of North Carolina. The next day, students discussed what they learned and “fancied up” their notes by adding details, labels and captions to their representations of the trip. We posted student work on the bulletin board and referred back to it throughout the project. Next, teachers invited guest experts from the Native American Center at the University of North Carolina, to come and speak about the cultural impact of Native Americans in North Carolina. We learned about many contributions from the Native Americans in our modern lives (chewing gum, latex, mouthwash). Our Folklife Project was filled with many rich experiences and guest experts. During each experience, students took notes, completed sketches and took digital pictures. The following day, we discussed what we learned to consolidate our knowledge and then added details to notes, sketches and photos and posted them. As our knowledge grew, many questions emerged. Visit to a pottery studio-Joyce Bryan and Lara O’Keefe taught students about North Carolina pottery and demonstrated how to throw a pot on a wheel. Students wondered why there were so many potters in this part of the state. Students decided to research this question after returning to school. Visit to Chatham Mills- This former textile mill is being restored to teach people about the textile industry in North Carolina and to provide spaces for community-friendly businesses to set up. Tom Roberts, the owner of the mill, and Barbara Pugh, head of the Chatham County Historical Association, met with students and talked about the Chatham Mill and its history and the textile industry in North Carolina. It was once one of the only two mills in the world that made woven silk labels for clothes. Two of Barbara’s aunts and thousands of other North Carolinians spent their working lives in mills like this one. Visit to McGinnigle Woodworking- We learned about North Carolina’s once thriving furniture industry in a vastly downsized version here. Alan McGinnigle (who was producing hand-made weaving looms 35 years ago when our teacher, Steve, first met him) showed us how wood goes from rough lumber to a piece of furniture. We learned that the steps are essentially the same whether in a custom shop or a manufacturing plant. Visit with Elaine Chiosso, director of the Haw River Assembly. Since our culmination for our Folk Life Project will be putting on our own folk festival, we met with Elaine who has organized and run more than 15 Haw River Festivals. She explained the steps involved and helped the students generate the beginnings of plans for their own festival. In May, Glenn Hinson, UNC professor and chair of the folklife curriculum brought The Branchettes, a gospel group to Duke School. They played traditional gospel tunes and told us how gospel music emerged in North Carolina. In addition, our classes saw videos and read additional research in library books and online. Each classroom has a Project Notebook with many articles about North Carolina folklife. http://ncmuseumofhistory.org/ They have videos that are available through the mail or through streaming. http://www.musicmaker.org/artists_profile/The-Branchettes Students can listen to the Branchettes sing “One More Day” at this site. Make a plan (see attached Folk Festival Plan Sheet). Students had to keep a daily log of their progress as they prepared for the festival. Do research to find out information for a display for the Folk Festival. The display would teach others about the art form. Articles from the North Carolina History Museum and library resources were readily available. Create an attractive display that would teach others. Students worked in small groups and divided up the work- photographers, reporters, caption writers, sketchers, or bulletin board decorators. Create a “product” to share. Students practiced giving oral presentations about their topics, and tried to anticipate questions that might come from the audience. Many students choose to have some sort of active demonstration or hands-on activity at their stations. Students wrote letters and made flyers and signs inviting parents and faculty members to their Folk Festival. The Folk Festival was held in our classrooms and outside-performances and booths with pottery and quilting indoors and woodworking outside. After it was over, students had a rubric on which to rate their experience and participation. Teachers also used the rubric to evaluate student work. For next year, we will drop storytelling as an area of student expertise. It seems difficult for students to craft and deliver a short, coherent story. Perhaps next year, we will have everyone attend the performance and then visit the visual artists; otherwise, there are too many distractions for the performers as guests flow in and out. The rope bed/doll chair selection for woodworking was better than the group projects we have tried in the past. It might work better to limit quilts to a set size or number of squares, though the students who didn’t get done just did a live demonstration during the festival. Pottery was extra successful because of a lot of work orchestrated by Marki, our art teacher. We may not always be able to count on. This needs to be anticipated next year. We might include traditional food as an option next year. One thing that worked well was to have the daily reflection as students prepared for the culmination and to include a reminder- “only ___ days left,”as an urgent reminder of time limits.